New Perfima 500 installed in Fine Foods’ plant in Brembate, Italy. Fine Foods & Pharmaceuticals NTM S.p.A.
of new coating equipment in the site of Brembate. «We were looking for a coating system that would ensure us four advantages: full adherence to GMP standards, ability to handle from medium to large batches, ease of cleaning operations and efficiency in the production cycle management. We found them all four channelled into Perfima». a perfect and uniform mixing of the cores. 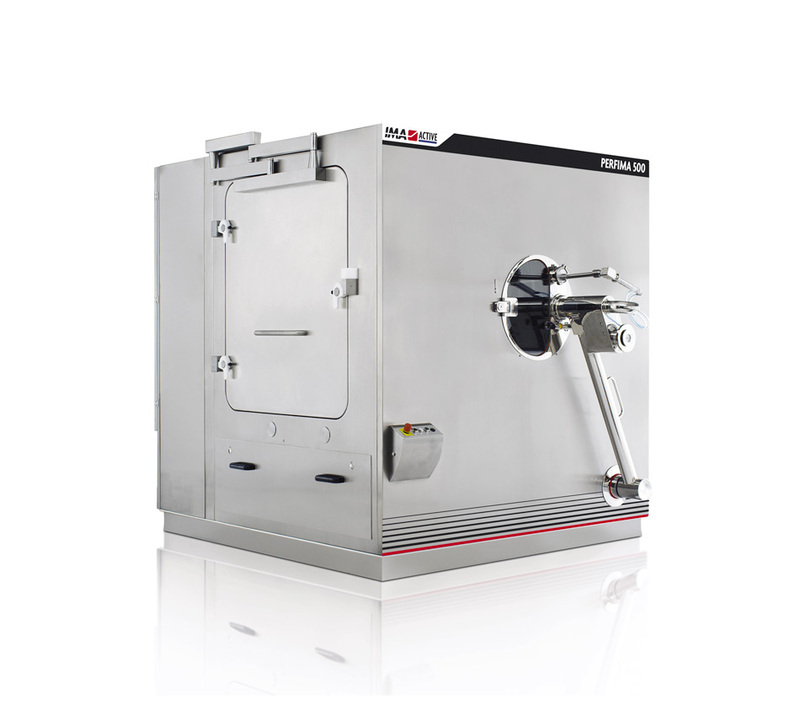 The mixing capability is assured in case of minimum or maximum quantity of product, allowing a wide range of batches to be processed in the same machine (from 25% to 100% of the pan capacity). Perfima spray guns feature an Anti-Bearding-Cap (ABC) system avoiding guns clogging while the machine is working. Fitted on a sliding support arm adjustable from the outside, the spray guns can be easily changed, calibrated and cleaned. The machine is equipped with a completely automatic Clean In Place system validated by IMA in collaboration with the University of Parma (Italy). The cleaning cycle can start immediately after the process without any need to install additional devices: cleaning nozzles and spray balls cover all the machine’s areas to be cleaned. «Pefima’s Clean In Place system has modernized our approach to the cleaning phase», says Mario Barbini, Director of Pharmaceutical Activities of Fine Foods. «Thanks to Perfima, we halved the washing time, gaining a batch of production a day. In just over two hours the pan is washed and the room stays clean». It is not only for the technological advantages of its machines that Fine Foods chose IMA. «IMA Product Managers networked excellently with our technicians», continues Mario Barbini. «Our installers and IMA designers worked side by side to define the project specifications. All the machine’s devices have been explained and tested in such a way that, during the installation, there was good familiarity with the system». The timing, afterwards, is self-evident. «Three and a half weeks after the machine’s delivery we were ready for the SAT (Site Acceptance Test)». 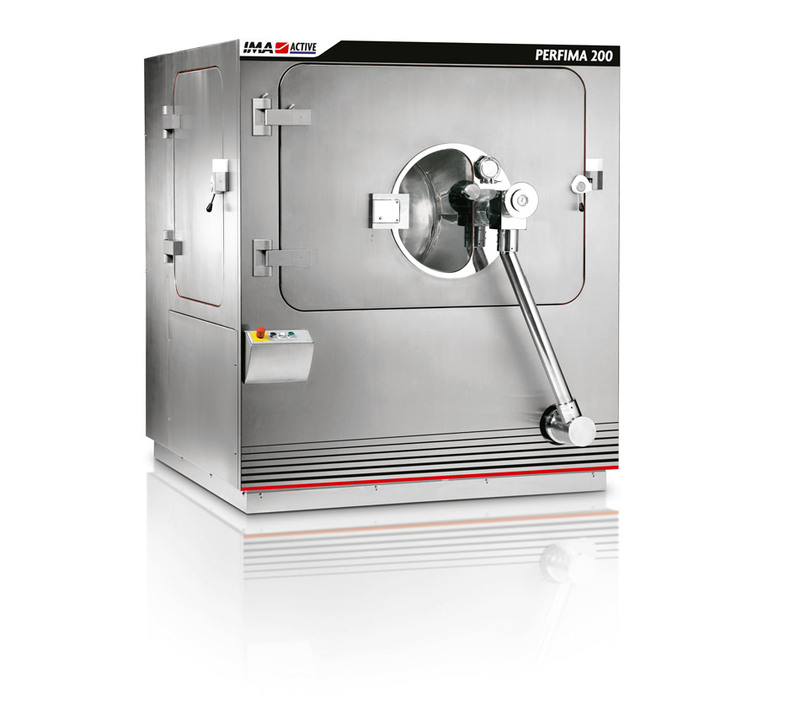 During the session of preliminary tests held on the Perfima 200 installed at the IMA Active Laboratory, some of the most challenging Fine Foods’ processes were tested. The first step was to test both on minimum and on maximum batches a very diluted nutritional coating solution. The result of the test conducted on the minimum batch has allowed to achieve a weight gain of 3.7% in about one hour of spraying. The second step was to test an active ingredient sensitive to light and to acid rate to be coated with three different layers to ensure both the total protection and the gastric resistance of the tablet. The collaboration between IMA process technologists and Fine Foods’ specialists has led to excellent results from the very first tests, optimizing the use of the three suspensions in sequence and the related processing times. in a three-layer film coating process both on minimum and on maximum batches in the same pan, without any changes in the machine’s set up. The excellent results gained during the preliminary tests were confirmed afterwards, once the equipment was installed and put into production: the processes have been easily transferred from the old technology to Perfima, allowing a reduction in process time of 30% compared to the past.